WHEN our armed forces go off to war via sea, boat or by air, it is a tough time for the families left behind. And so it was for the Sea Harriers and their Royal Navy pilots, most of which were stationed at the Fleet Air Arm in Yeovilton. The Gulf War was very real and obviously life threatening, and the Sea Harriers were being prepared for the conflict, loaded with all the latest hi-tec systems with final checks and inspections being made on the runway. The press were invited to see them off at first light. We all turned up at the designated time of 5am when it was it was -5 degrees and pitch black. Standing around in that temperature took its toll on one reporter, who showed up wearing just a wooly jumper. He was taken ill with exposure and had to be stretchered off the airfield. 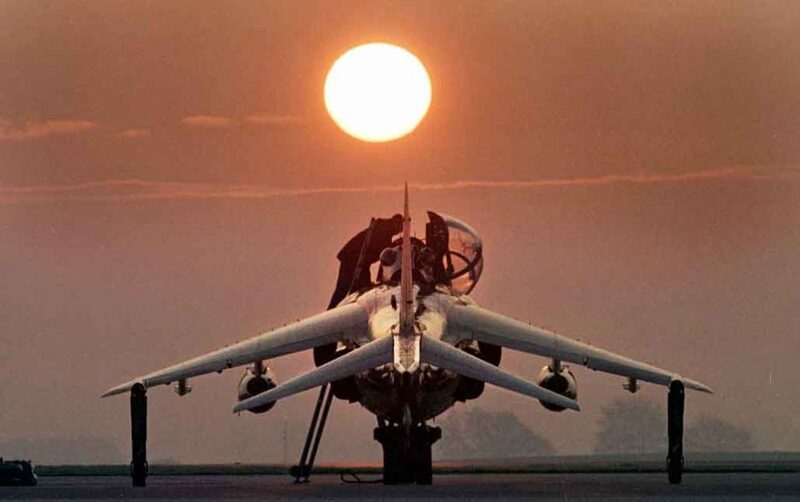 As we were being ushered off the airfield for another photograph, the sun suddenly came out from under the clouds to give this dramatic image of a Harriers getting its final check-over before flying to join an aircraft carrier already on its way to the conflict. 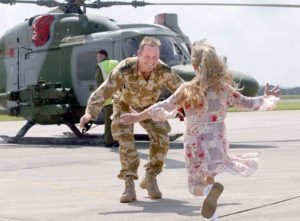 The famous quote by the late BBC reporter Brian Hanrahan – “I counted them all out, and I counted them all back” – could have applied to Yeovilton, as months later the heroes returned home to crowds of families with kids having a day off school to see their dads fly in. The spontaneous dash across the tarmac by the children (pictured right) had tears rolling down everyones cheeks, but always remembering those military men and women who didn’t come home.